Since 2013, the number of games added to Steam each year has skyrocketed, while average prices have dropped. Steam changed the video game industry in the same way Netflix changed television. Digital distribution was a natural evolution for gaming in the early 2010s, allowing PC players to skip the midnight-release lines at Gamestop and purchase new titles with the click of a button. 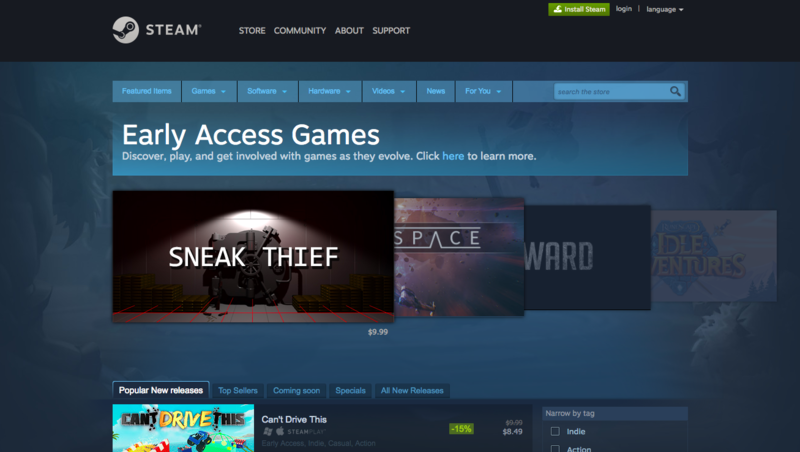 While Steam wasn't the first hub to offer digitally distributed games -- Valve debuted it in 2003 -- it quickly gained a massive following and by 2011 was undoubtedly the largest platform for finding, buying and playing games on PC, Mac and Linux. Today, Steam hosts more than 10,000 titles and nearly 160 million active users per month, according to Steam Spy and EEDAR. Steam is Netflix on pixelated, interactive steroids. Even consoles eventually followed Steam's lead, becoming more connected and relying less on physical discs with each new generation. In 2013, Microsoft attempted to launch the Xbox One as an always-on console that would eliminate disc games, but the living-room audience wasn't ready for a digital-only reality. Still, both the Xbox One and PS4 essentially operate as disc-less consoles, offering every game, update and service via online connections. 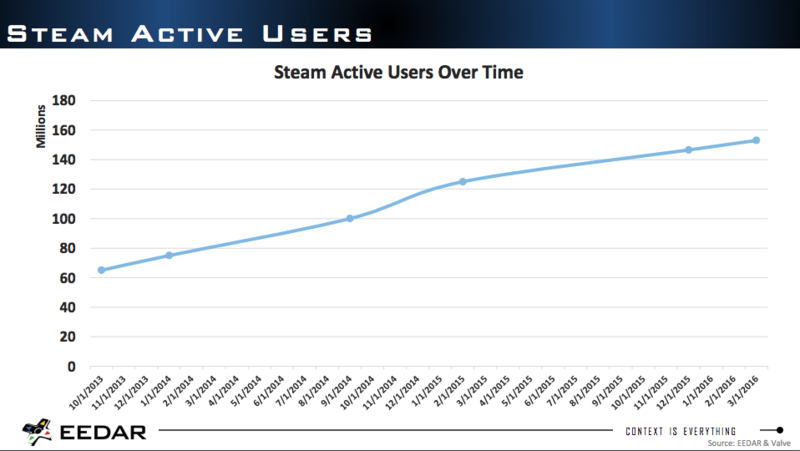 Steam is a leader in the gaming industry, often setting or predicting trends that will dominate the rest of the market in due time. And, over the past few years, it's been setting another trend that sounds daunting for new, especially independent, developers: game saturation. "It used to be that an indie game of reasonable quality, released on Steam, would probably at least break even. That is no longer true," says Jonathan Blow, creator of Braid and The Witness. "I don't think Steam is anywhere near the App Store in terms of oversaturation -- yet? -- but it has definitely gone in that direction." A few major changes have rocked Steam since 2012, starting with the launch of Greenlight, a process that allows players to vote in games that they think deserve to be sold on Steam proper. Greenlight replaced Valve's in-house curation system staffed by employees, instead allowing players themselves to determine whether a game was good enough for the service. Aside from outsourcing the curation process, Valve hoped Greenlight would help developers market their games, offering an extra layer of fan interaction and awareness. Greenlight was confusing and even detrimental for some developers, even two years after its launch. However, Greenlight cracked open the door for plenty of new studios and Steam began hosting more games than ever before. Valve accepted 283 titles in 2011, and by 2012 that figure had risen to 381, according to Steam Spy. In 2013, 569 new games were added to Steam. That's when Early Access came along. In March 2013, Valve debuted a program that allowed developers to sell unfinished, in-production games on Steam. It was an idea similar to Greenlight, allowing developers to cultivate communities before their games actually went live, but this service could generate revenue at the same time. This was an easier sell to developers and it led to some great success stories, even for small titles. These two shifts in Steam's operation opened the floodgates. In 2014, Steam Spy says the service added 1,783 games, more than tripling the previous year's number. In 2015, Steam added 2,989 games, and so far in 2016, the service has accumulated 3,236 more. There are 10,243 games on Steam and more than half of them have been added in the past two years, even though the service has been live for more than a decade. Rami Ismail, co-creator of Nuclear Throne and Ridiculous Fishing, says Early Access changed Steam entirely. Most games on Greenlight eventually make it to Steam now and Early Access pushed developers to sell services (continually updated gaming experiences), rather than products (like a boxed game). "The increased competition on the platform has changed some crucial elements at Valve," Ismail says. "The curational quality of Steam has disappeared, which has its pros and cons, and developers are eagerly participating in the race to the bottom for PC games too. If anything, this will further popularize subscription-based, free-to-play and DLC models on the platform." That "race to the bottom" reveals itself in Steam Spy's stats. While the number of Steam games has risen dramatically over the past three years, the average price of those games has fallen to $10.33 in 2016 from $14.21 in 2013. With an influx of games and falling prices, developers are unable to rely on Steam the same way they used to in the early 2010s. Ismail says that, back then, a decent game could net 10,000 sales or more at launch, but today many great games end up in the "2,000 graveyard," selling just 2,000 units before disappearing from the charts altogether. "I think the idea of Steam being this mythical money-maker that instantly makes people rich is mostly a myth that held some truth back at the start of the decade," Ismail says. "Nowadays, you're less dependent on launch and more dependent on sales, maintaining visibility over time and building a community. Which, I guess, explains why Early Access is so popular." Steam may be crowded and pushing a new breed of developer-player relationships, but it's far from a worst-case scenario. Plenty of developers keep their eye on multiple platforms, and the mobile marketplace has long been viewed as a bastion of gross oversaturation. It's nearly impossible to get noticed on the App Store or Google Play, each of which hosts roughly 2 million programs in total. "I don't actually think it's fair to compare Steam to the App Store," Firewatch and The Walking Dead lead writer Sean Vanaman says. "The App Store sets price expectations around $1 from day one, caters to every human being on Earth with an iPhone and, due to the App Store products being so diverse -- you can get Transistor, a date on Tinder and a recipe for eggplant parmesan all in the same 60 seconds -- you have tremendous problems with search, discoverability and pricing. There are over 1 million apps in the App Store. Sixty-thousand games hit the App Store per month. That to me is oversaturation." As powerful an influence as Steam is on the gaming market, it's still subject to the whims of a growing industry. Video games are becoming more mainstream by the moment, and the tools for creating games are more accessible than ever. More people are making games, which means there are simply more games to go around -- and that's a good thing, according to Jonathan Blow. "It's easier to make a game than it used to be," Blow says. "So to 'fix' that you either have to make it harder to make games or you have to put up barriers for people to get their games to an audience. Both of those sound pretty bad." The third option is curation, and Blow sees that playing out fairly successfully on forums and other third-party websites. 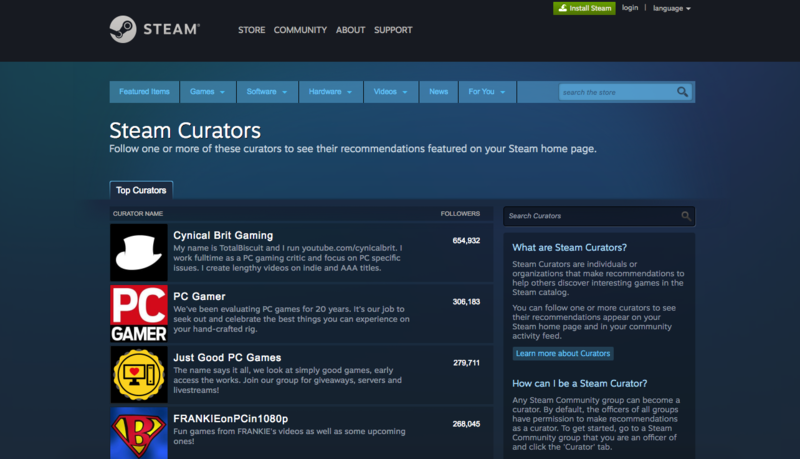 Steam did launch its own Curators system in 2014 featuring recommendations from established gaming websites and people, but as Blow puts it, "I don't feel like it has a lot of teeth right now." Ismail largely agrees with Blow's assessment of the industry. "Game development is becoming more and more like photography or music bands," he says. 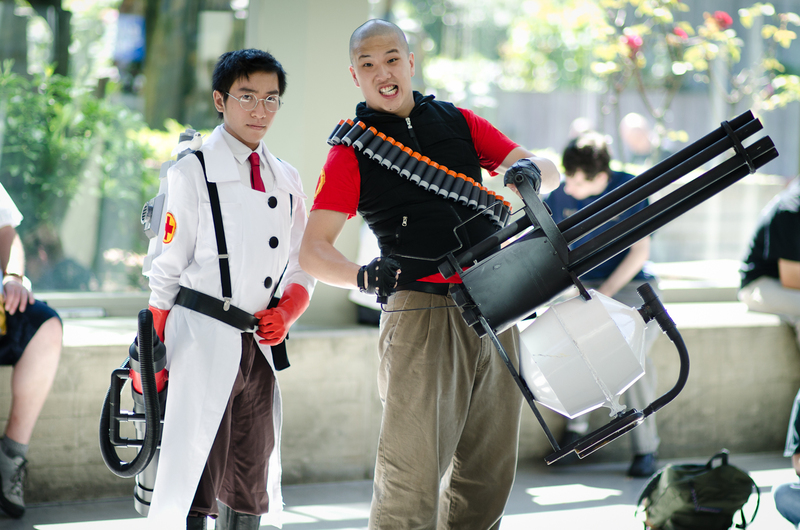 "As it gets easier to make games, that trend will accelerate. Think about it this way: Almost everyone can make a good photo or learn to play an instrument, but only a few do it professionally, and of those, only few can sustain themselves. Games will be like that too." The process of developing, marketing and selling a game -- especially an independent endeavor -- has shifted drastically over the past four years. Players expect transparency and consistent updates, and many times they even want to be involved in the game's production. This could be a side effect of the Kickstarter generation or an extreme extrapolation of the Minecraft model (the game was successfully sold in beta form for years). Whatever the reason, it's the new reality. Steam may not be a magical moneymaking machine for developers, but it is growing with the industry and evolving along the way. Besides, it's ill-advised for new developers to pin all their hopes on a single platform, Octodad creator Philip Tibitoski says. Every platform, from PC to consoles to mobile, changes regularly due to circumstances that developers simply can't control. "I'm not sure developers could ever depend on Steam in the way a studio or individual starting out might think they could," he says. "The games that thrived on Steam three years ago or so were games with robust promotional cycles that focused around mechanics or ideas that grabbed people within that zeitgeist." Tibitoski recommends finding a platform that makes sense for each individual game. That means negotiating with Valve, Sony or Microsoft to get the game showcased on their storefronts, and making sure the studio's audience actually uses its chosen platform. "In my experience, there are no guarantees, and all you can really do is build on your own ability to be adaptable, self-aware and cautiously courageous in the choices you make," Tibitoski says. Whatever the modern developer's preference, Ismail and Blow agree it's best to not launch a game on mobile first. Blow suggests a more curated platform like PlayStation 4, or even a dual-platform launch that hits Steam and PS4 at the same time. Ismail says to "launch as often and in as many stores as you can." "If you're doing a game across Steam and mobile or console, do Steam first," he says. "Even though you're developing them simultaneously and the order barely matters in most cases, people hate mobile and console games coming to Steam, but console and mobile users love PC games coming to their platforms." Success on Steam is all about these tricks -- and its marketplace has certainly gotten trickier over the past four years.